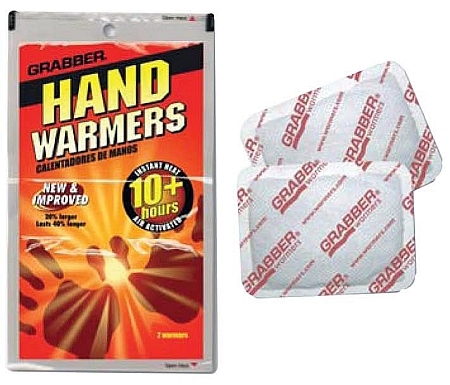 Grabber Hand Warmers are standard equipment for skiers, snowboarders, hunters, campers, hikers, birdwatchers or anyone who works outdoors when the weather is cold. Keep plenty of Warmers your car, desk, coat closet and emergency kit. Never be without portable heat when you need it. Air-activated Hand Warmers keep hands and fingers toasty for over 7 hours. No shaking or kneading required. Simply open the package and put the Hand Warmers in your glove or pocket for a few minutes to start the process. Warmers are widely used as portable, long-lasting heat therapy by those who suffer from sore hands, joints, fingers and toes as a result of Arthritis, Raynaud's, Lupus, Scleroderma, Sjögren's, Myalgia or just poor circulation. 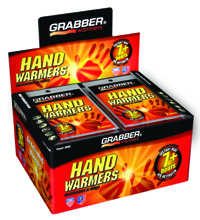 All Grabber Warmers are designed for one-time, disposable use. Case of 320: 8 display boxes of 40 pair each.